Through the Dante Alighieri and the Consulate of Italy in Detroit, I learnt of an interesting performance taking place on June 19 and 20 at the Top of the Park Summer Festival in my own Ann Arbor. The performers were two Italian acrobats, Luca and Andrea Piallini. Breaking the initial inertia of leaving the house for a 9:30 pm performance on a weekday was not easy, but highly worth it. The show was fun to watch and interesting to think about. A surprising and fully integrated combination of 2-D, design background on the screen, and 3-D, live acrobats acting as if the 2-D design were real structures and the cop and the robber were limited by the real world. 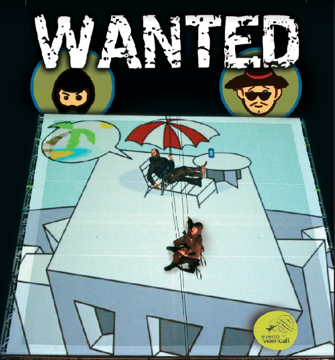 “Ann Arbor welcomes two Italian brothers for the Michigan’s première of “Wanted”, eVenti Verticali’s world acclaimed show with interactive video-projections. 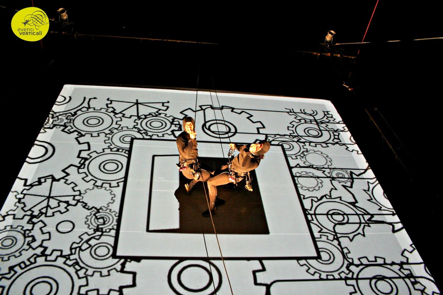 Hanging on a giant screen supported by a crane, the two actor/acrobats defy gravity dancing and jumping suspended on harnesses. They interact with the video sets blending 2D and 3D and turning a funny “Cops and Robbers” chase into a great show for all ages. 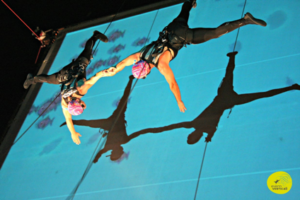 Wanted is an aerial physical theatre work in which two characters are drawn into a world of comics and animated films through projected large-scale videos, while performing over the audience suspended from harnesses. The two characters go on an adventurous trip teetering between the fictitious nature of animated drawings and the pseudo-reality of a computer screen. They are on the run – they traverse the globe, jump tall buildings, and tunnel their way into safes! The computer itself becomes a character, intervening and interacting with the two heroes on its desktop, transforming them into 1980’s videogame characters.